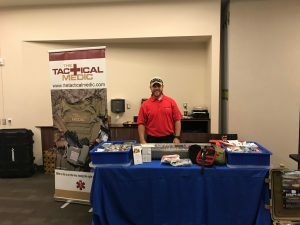 On Friday, October 6th, ICSAVE was honored to be a part of this year’s Maricopa Integrated Health System’s Annual Trauma Conference. Hosted by the city of Casa Grande and their Public Safety Academy, internationally renowned experts Dr. Sydney Vail and RN Tracy Brooks brought in several subject matters experts to examine trauma from multiple perspectives. Numerous attendees from both the clinical and pre-hospital settings attended to learn from and discuss the multi-faceted issues facing these topics. The attendees unanimously embraced ICSAVE’s advocacy for Community Resilience, Outreach, and Active Violence Prevention and Preparedness programs. On behalf of all of us here from ICSAVE, thank you for allowing us to participate and we look forward to seeing everyone again next year!